Farmington police are searching for the man they say walked into a stranger's home Thursday afternoon. It happened around 3:30 on Birchwood Street just off Farmington Road. According to police, the man entered the home through an unlocked side door and came face-to-face with a 14-year-old boy, who was home alone. FARMINGTON, Mich. (WXYZ) — Farmington police are searching for the man they say walked into a stranger's home Thursday afternoon. It happened around 3:30 on Birchwood Street just off Farmington Road. According to police, the man entered the home through an unlocked side door and came face-to-face with a 14-year-old boy, who was home alone. “It freaked me out a lot," said neighbor Peggy Grainer when she heard what happened. Public Safety Commander Bob Houhanisin said when the man saw the teenager he took off. “On the Facebook page that’s on the subdivision that I’m a member of, there was two people that saw this man in the last couple days walking down the street," Grainer told 7 Action News. 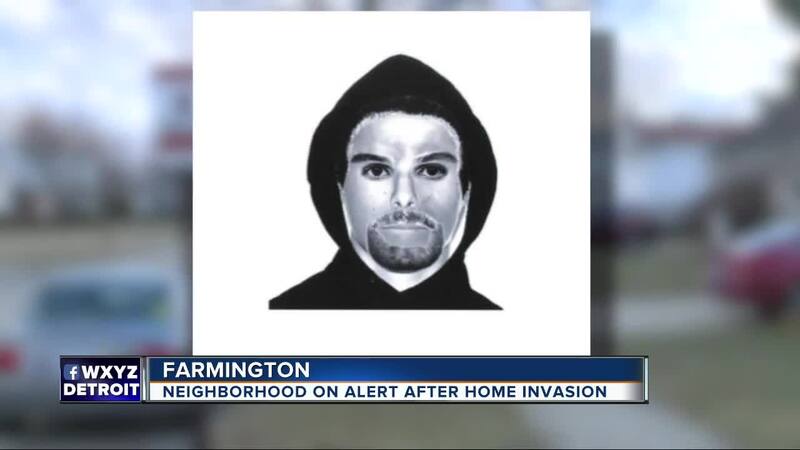 The suspect, who has not been located, is described as a thin white male with a scruffy goatee, who was wearing a black hoodie at the time of the incident. Police are now warning residents to keep their doors locked, even if they're home. 7 Action News spoke to the teenager's father, who said the family is shaken up by the whole ordeal. He believes their large dog may have scared the suspect off. “I was working out here in the driveway, getting my boat ready, and all of a sudden I saw the police go down there and I’m like what the heck is going on. Last thing on my mind was a B & E," said Vern Grainer, another neighbor. No one was hurt during the home invasion. Police are not sure if the suspect accidentally wandered into the wrong home, or intended to steal something. It's unclear if the man was carrying any weapons. “These are often crimes of opportunity and we want to limit that opportunity as much as possible," said Commander Houhanisin. Anyone with information about the suspect should contact Farmington Public Safety at 248-474-4700 ext. 2.